Volkl 90Eight Skis - Men's: The 90EIGHT is the most versatile ski in the most versatile range. 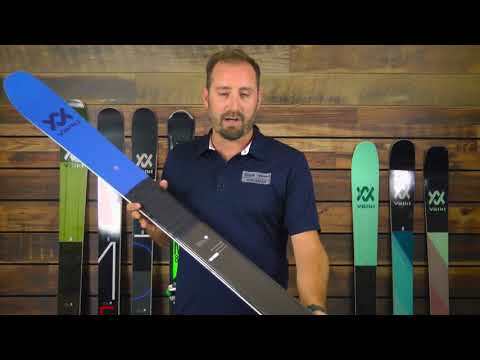 With its 3D.Ridge construction and added 3D.Glass, designed to reduce the ski’s weight while increasing stability and smoothness, the 90EIGHT is an all-mountain ski that handles anything from bumps, to trees, to groomers, and even powder and crud. The moderate taper sidecut and precision-matched flex allow you to steer it anywhere you want to go to rip up the mountain with an easy, cruisy feel. And on a sidenote: This tip & tail rocker ski originally wasn’t built for on-piste usage, but it is always a pleasure to see how good it works there too. 3D.Glass would be nothing fancier than another base layer of glass were it not for a clever modification: in the binding area the glass extends vertically up the sidewall and over the top of it. It’s sort of a demi-torsion box, with much the same effect as this time-honored glass molding technique: the ski becomes both more torsionally rigid and livelier, as the hard-wired memory of the glass will dominate the rebound characteristic.